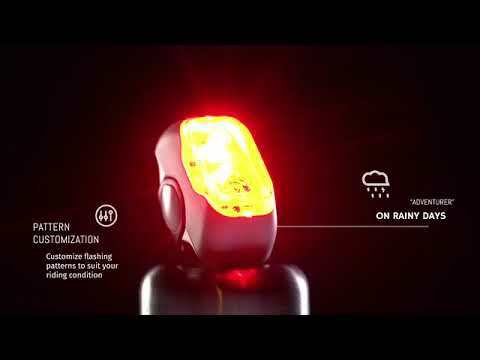 Rayo is a new intelligent bicycle tail-light designed to increase your visibility in all riding conditions. The gadget is equipped with three multi-purpose LEDs, engineered optics, motion detection and bluetooth connectivity features. We’ve seen other intelligent bike lights but this is one of a select few that has speed-controlled light output thanks to a three axis accelerometer and a 3-axis gyroscope. When it determines you are slowing down Rayo will automatically trigger a brake light to warn traffic and riders behind you. The combination of three ultra bright and highly efficient LEDs, and two TIR lenses with different specifications ensures balanced visibility from all angles. At a maximum of 90 lumens with specialized optics, Rayo is also visible in the daylight. With mobile app connectivity, you can customize the blinking patterns of each LED allowing you to create signaling options to suit your riding style and weather conditions. If you’re riding with a group, everyone can automatically sync blinking patterns without the hassle of complicated pairing procedures. Rayo also doubles up as a theft alert device. It can notify you through the mobile app when your property is being tampered with giving you some peace of mind when leaving your bike behind. The IP67 water-resistance gadget easily attaches to any bike with seat-posts up to 32mm in diameter. With 5 colors to choose from, it comes equipped with touch control and a rechargeable battery that runs for up to 20 hours.